Panama has a warm tropical climate. 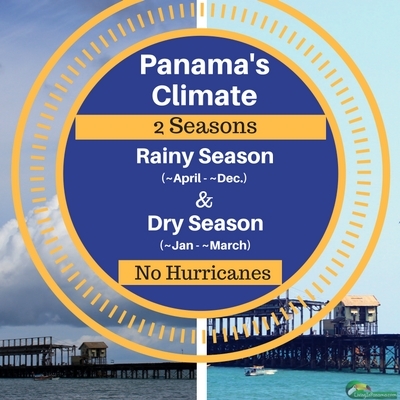 Panama has only two seasons: Dry and Wet (or Rainy). Like all countries close to the equator, Panama’s temperatures do not vary by much throughout the year. Although, temperatures do vary by elevation. Generally, places at 3000 feet are ~10 degrees cooler than areas at sea level. Keep in mind that Panama is a narrow land mass between two oceans, with mountains in the middle. This means its temperature and weather are easily affected by the conditions across both oceans, as well as the impact mountains have on those conditions. Panama is completely outside the hurricane belt and experiences few, if any, natural weather disasters. The rainy season is from mid-April to mid-December (give or take a week or 2). The rains start gradually, building to its peak, usually in November. Keep in mind, it does not rain continuously during the rainy season. Typically, it rains HARD for 15 minutes to a couple hours in the afternoons. You can get completely drenched in seconds. The rest of the day is usually sunny. When it starts raining, people typically take cover and wait it out. Normally, the rain doesn’t last long. In the rainiest time, November – mid-December, it sometimes can be overcast and/or rain for hours during the day or the night. But some years, those months produce no more rain than the other rainy season months. There is usually a short dry spell in the middle of the rainy season, in July/August, which locals call the veranito or “little summer”. The dry season is from mid-December to mid-April (give or take a week or 2). The dry season peaks in March. At the start of the dry season, flowering trees burst into bloom. Toward the end of the season, all the grasses turn brown and everything seems to wilt. Personally, I find March, especially late March (when I am writing this) to be too hot for me. I tend to escape to the highlands that last week of March. Each dry season, much of the south side of Panama, especially the Azuero Peninsula, experiences a drought. Which means the Azuero can have water shortages for farming purposes, and even sometimes for drinking. Occasionally El Nino, and the drought conditions it can cause, have been so severe that ship traffic through the Panama Canal is curtailed to some extent. The dry season is “summer” vacation for the schools. Schools typically start in late February or early March and end in early December, just as the dry season begins. Too bad students have to start school during the hottest part of the dry season. The high season for tourists in Panama is from December – March/April. That is, during Panama’s dry season – at least on the Pacific side. It seems clear that people visit Panama to escape the cold weather at home. Plus, travelers are often nervous about visiting during the rainy season. They are understandably afraid they’ll spend their vacation couped up in a hotel room due to perpetual downpours. Of course, if you visit the Caribbean during in those months, especially December – February, you will most like get rain – LOTS of rain. However, the dry season, particularly March, is my least favorite time in Panama. It is just so hot and dry then. I love the rainy season. I find those torrential downpours continually awe inspiring. The kids, and sometimes I, love to go out and play in the all the water pouring out of the clouds. I never tire of it. Well, except for the occasional November when we have rains that last all day. However, the typical storm only lasts 30 minutes to an hour. Plus the rains and occasional cloud cover really cools everything down. I also love all the green lushness of the rainy season. Everything grows -and fast. An especially wonderful phenomenon if you are a gardener. Conversely, towards the end of the dry season, Feb – mid-April, everything seems brown and dry. My advice is to come whenever you can get away from your demands at home. I don’t think you should fear the rainy season. It usually just rains for an hour, maybe 2, in the afternoons. However, if you don’t want to experience day-long rains, you should not travel from November thru mid-December. By avoiding this period, you also avoid Panama’s 5 holidays in November, which can be a good or a bad thing, depending upon your perspective. If you are only going to visit the Caribbean side, and want less rain, time your visit for September – October or February – March. It rains less in those time periods. And don’t forget your bug repellant. It is significantly bugger on the Caribbean side, especially on the islands. Panama has 3-4 climate regions and hundreds of microclimates. All these climates are tropical. However, the rainfall, wind, and temperatures can be noticeably different among these 3 regions. For instance, when rain falls in one region it tends to be drier in another. It rains almost all year long on the Caribbean side, especially between December and February, which is the dry season on the Pacific side. September and October are relatively dry on the Caribbean side, but the rest of country can expect rain most days during those months. The Caribbean side of Panama gets significantly more rainfall than the Pacific. Typically, Bocas del Toro and the rest of Panama’s Caribbean Coast receives twice as much rain as the Pacific Coast. This area often gets rain year long – but only in the afternoon, especially in the highlands. In these mountainous areas, it tends to be cooler, winder, and wetter than the Pacific and Caribbean side. Well, actually the Caribbean side is still wetter. The Azuero Peninsula is known as the desert of Panama. This is because the rise in cattle ranching on the Azuero led to deforestation,which in turn resulted in a significant drop in rainfall. The Azuero gets about 50% less rain than the rest of the country. So it is a good choice if you want warm weather combined with less rain. Panama’s microclimates can be extreme, with a relatively dry environment next to a rain forest. In some highland areas, a difference of 500 feet in altitude can sometimes mean being stuck in perpetual low cloud cover, versus being in sunshine. There are seasonal winds in some areas, especially in the mountains, but other nearby areas aren’t windy at all. In another twist, in some coastal areas the prevailing winds reverse seasonally. The mountainous area of the central spine of Panama has the most microclimates because it is impacted by both oceans and mountains. The Boquete area alone has 13 microclimates. For example, Alto Boquete is noticeably winder, wetter, and cooler than nearby Dolega. If you want an in-depth understanding of Panama’s climate and weather, the 13 microclimates of Boquete, and a wealth of weather resources you should check out this site. Forecasting weather in Panama isn’t done much. This is because the weather here in Panama is both boringly predictable as well as wildly unpredictable. There are no weather forecasts in Panama’s newspapers or TV programs. You can always predict a 90% chance that it will be hot and sunny during the dry season, and hot and humid, with a 40 – 50% chance of afternoon thunderstorms, during the rainy season. What is the point of “forecasting” some variation of that everyday. However, because of the widely varying and often rapidly changing weather conditions in hundreds of microclimates throughout Panama, it is impossible to predict the time and place of those thunderstorms. You may know it will rain in your region today, but you don’t know when or where. It can change from sunny cloud-free skies to a torrential downpour within 30 minutes. And temperatures, in turn, are dependent on that rain and cooling cloud cover. The best way to know the weather in a specific location in Panama is by being there or talking with someone who is there. If you want to know about Panama City, you can also check the webcams in that area. When you look up the weather for Panama online, most likely you are getting the weather at the Tocumen International Airport. There is a weather station at the airport, which is 15 miles east of Panama City. However, that weather station, and others in Panama, are often inaccurate or are off-line and unavailable for those international reports. In addition, the Panama Canal Authority’s Doppler radar station, the only one in Panama, is terribly inaccurate and sometimes out of service. Not only are the weather stations often inaccurate, but there are not many of them in Panama. For instance there are no weather stations in my district of Baru (which is in the Chiriqui Province). Unfortunately, the online weather reports do not tell you which station they are using for their weather report or when it was last online and contactable. If you want to know where the weather stations are in Panama, use this site. These variations in weather and climate in Panama is one of the many reasons you should explore Panama before deciding where you want to live. My husband Reyn also wrote about the lack of hurricanes in Panama. If you are moving to Panama, you should check out our moving to Panama to do list.